Kimchi is so tasty and nourishing. It’s so wonderful to eat as it is as an appetizer. Ever wondered that using Kimchi in a stir-fried dish is awesome too. 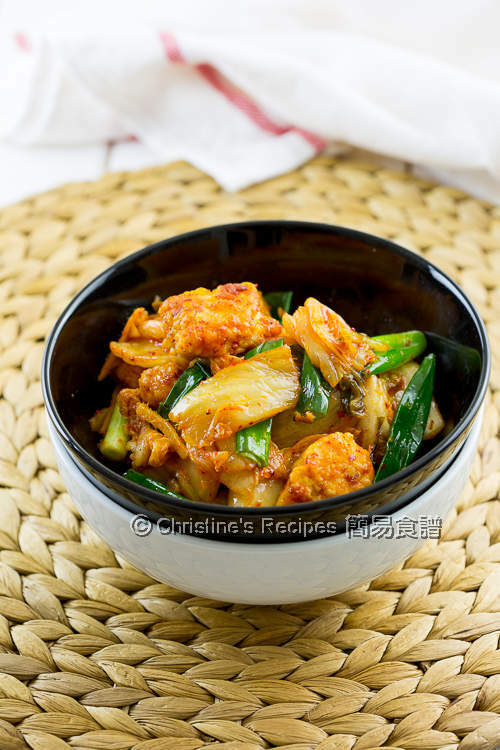 Its spiciness, saltiness, slight sourness will get you complete a delicious dish. Chicken meat is so perfectly matched with this hero ingredient. This dish is downright easy and quick to make. Give it a go if you’re intrigued to try what this dish tastes like. 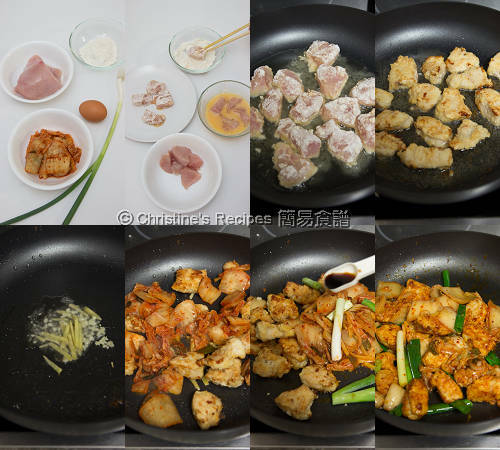 Cut chicken breast into 2.5-cm (1-inch) chunks. Season with salt and pepper. Lightly coat with whisked egg, followed by plain flour. Heat enough oil covering a pan over medium heat. Shallow-fry the chicken until all sides are golden brown and cooked through. Place on kitchen paper to absorb excess oil. Discard the excess oil in the pan, leaving about 1 tablespoon of oil. Saute ginger and garlic over medium high heat. Don’t burn the ginger. Toss back the chicken in pan. Add Kimchi and spring onion. Stir to combine. Season with light soy sauce and mirin. Add a dash of sesame oil to increase the fragrance. Serve immediately. Enjoy! Make sure not to cook the Kimchi too long in order to keep as much nutrients as possible. Simply combine it with other ingredients. Don’t cut chicken into too large chunks. Otherwise it takes quite long to cook them through. You can test the chicken with a chopstick. If it can easily poke through, it’s cooked. So very appetizing! 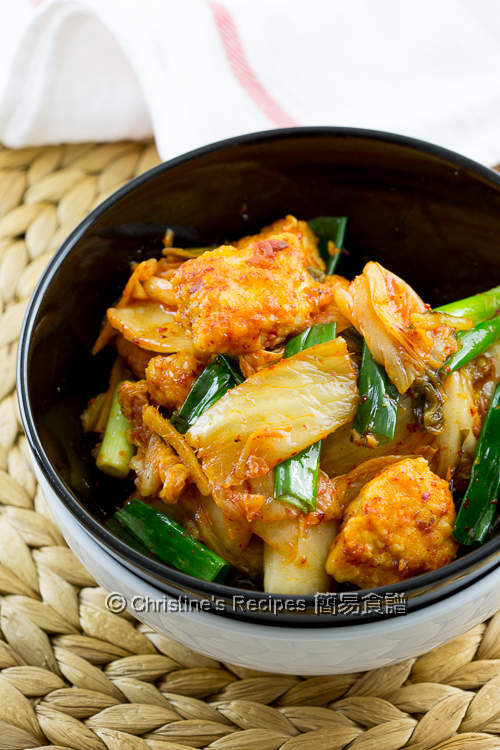 I am not exactly a kimchi fan, but this looks so delicious with chicken.